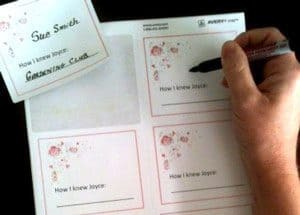 Help guests connect by providing nametags with space for more than just a name. First is name tags. 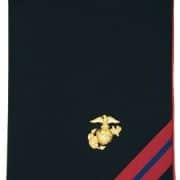 You may not have seen name tags used at funeral ceremonies or memorial services in the past. Because when people stayed in the same community their entire lives, name tags were probably not as necessary, In small communities most people knew each other. Today, children often move away from their childhood communities. Parents often move to retirement communities. When people gather for the ceremony, more than likely they will see some new faces. Even if the faces are familiar, as we get older, we tend to forget names and how we know someone. So this can make social situations like funerals awkward. Thus, I recommend a name tag. The tag will have an area where people fill in, “How I Knew Pam Smith”. Now attendees have not only the person’s name but the relationship. A conversation can start such as, “Oh, you were in Pam’s painting group, do you paint landscapes like Pam did?” Avery labels that you can purchase at any office supply store work great for nametags. You can visit the Avery website to download the Avery template 5164. Personalize the nametag with clip art, a favorite color or saying. 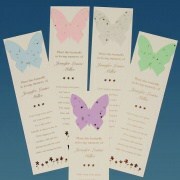 Images like flowers or butterflies can be incorporated and help to set a theme. Also, you can set up a table at the entrance to the funeral ceremony where people can fill out their tag. Next, suggest that they write their name clearly and in large print. 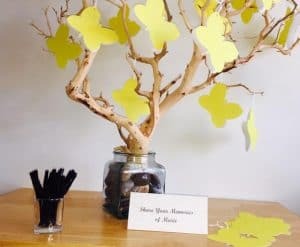 Another idea is to have a memory table. This table may be set up opposite from the name tag table or perhaps both tables could be set up along an entry way in a row. On the table you will want to place items that were important to the person whom you’ve lost. For example, if they were into knitting you may want to include a beautiful scarf or sweater, photographs are also great to put here. Or, if they were collectors, you may want to include some of their prized items from their collection. Tickets to favorites sporting events or concerts would also be appropriate for the table. The idea is to capture the essence of the person on the table so anyone can see what this person was into. Likewise, use golf scorecards if they were a golfer, or if they were a gardener perhaps clipping from their garden. Another example, if they had a favorite food or candy, you could have a bowl where guests could help themselves. View more ideas and memory table examples. Think about your loved ones hobbies and passions. 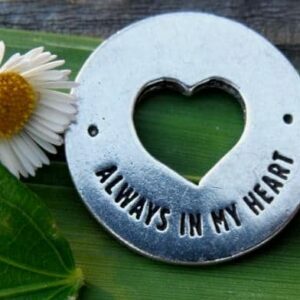 Gather some of the key things that were important to your loved one. At the entrance to the service, have the items displayed on a large table. 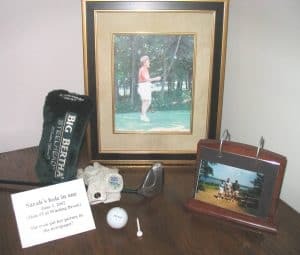 You may want to write on a notecard, “Look at Sarah’s hole in one on hole 7.” If they liked golf bring in the clubs, tees, scorecards and golf balls. 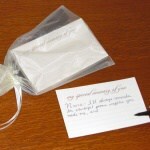 The third idea is a memorial or funeral memory or guest book. 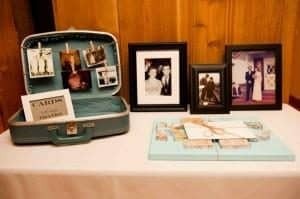 First of all, I prefer guest books that incorporate photos of the deceased and a space to write a bit about the life that they led. Most people just have a book to write in names of people who attended the ceremony. 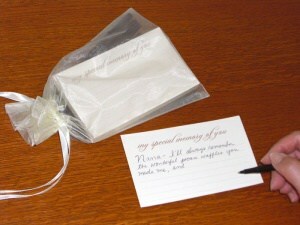 How about if the person is encouraged to write how they knew the departed? Seems like a book full of names of people many of whom you don’t know becomes a pretty meaningless book. The books we designed include memory cards. You’ll read about them in the next idea. 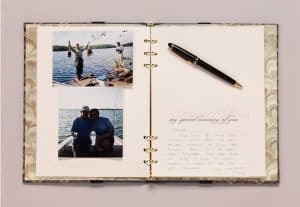 Life Celebration Book captures memories using photos and cards filled out by guests. It is also a register book. The fourth idea is memory cards. 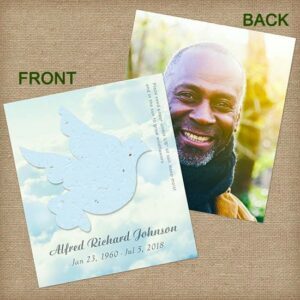 The cards are designed for family and friends to write on at the funeral ceremony. They say, “My Special Memory of You” . They are lined on both the front and the back. 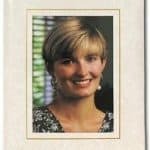 At the service, I recommend taking a break between eulogies and the person who is leading the ceremony can suggest that people write their memory on the cards. 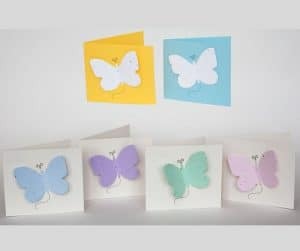 A couple of relatives or friends can hand out the cards. Another option is to place them on pews or on chairs. It is best to incorporate them into the service. Otherwise, people will put them in their pocket and forget to send them to you. 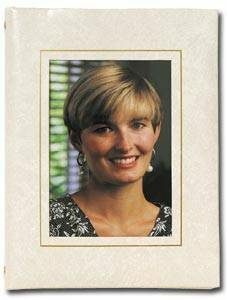 These cards can be shared on holidays, the departed’s birthday, or anytime you want to remember the special and unique person you loved and lost. Certainly these cards can then be handed down to generations to come. You can purchase them on our website, or you can print something similar or have them printed and cut at a local print shop. Also, you will want to make sure to provide extra pens in case people don’t have a pen with them. Lastly, the final idea is seed cards. 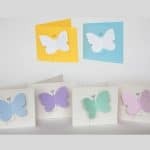 These cards are made of special handmade paper that has seeds embedded into the paper. 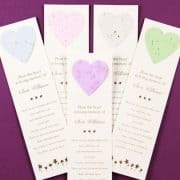 So when you plant the cards wildflowers or forget me not flowers will grow in memory of your loved one. 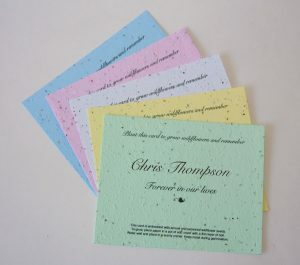 Hand them out to friends and family at the funeral ceremony. 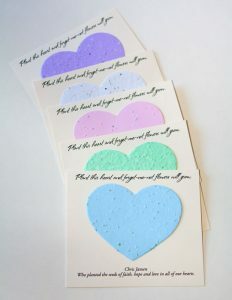 Then you can plant these in your garden, at the gravesite or perhaps even where the cremated remains were scattered. 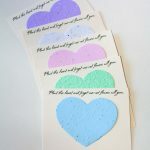 The cards can be personalized with a tribute to your loved one at no additional charge. Need more help getting started? 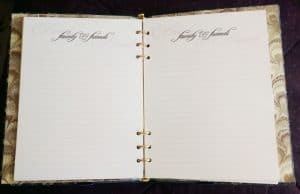 Download our book Planning a Celebration of Life. Because it’s full of ideas, tips, examples, and has a handy planning checklist. More resources: Funeral Memorial Songs, Memorial Poems and Verses, How to write an Obituary.